While Ascension Day is a Day of Holy Obligation, it is one of the most neglected feast days of the Christian church. This is sad enough in itself, but in ignoring this festival, the opportunity is lost for reflecting on what the Ascension means. Maybe we tend to ignore Ascension Day because it falls on a weekday. Is this the reason it doesn’t get the attention it deserves? This is a pity because it is full of significance in the historical life of Jesus when on Earth – and his continuing ministry for us in heaven. As a weekday event it reminds us that Christianity isn’t just something for Sunday – it’s an experience for every day. As Christians, we are to celebrate Our Lord every day, every second of our being. If we gloss over its truth we rob ourselves of a most important doctrine, for without the Ascension, the work of Christ would be incomplete. Because we do not place as much emphasis on the Ascension, we miss its tremendous truth. What Saint Augustine says here resonates with the passage in Ephesians 4:10, where Saint Paul says that ‘He who descended is he who also ascended far above all the heavens, that he might fill all things’ – i.e. ; that by ascending into Heaven, and taking our human nature up with Him into the heavenly places, He completed the process of redemption by reclaiming His place as rightful sovereign of the universe, so that He might be present to us in a different way. If He had not so returned, the process would not have been completed, and as Jesus said in John 16:7, ‘it is to your advantage that I go away, for if I do not go away, the Counselor will not come to you; but if I go, I will send him to you’. The gospel writer Luke is renowned as a careful historian. When he recorded the birth of Jesus he rooted the event in its historical setting within the Roman Empire. He continues that same preciseness at the end of our Lord’s earthly ministry by recalling the place of the Ascension – at Bethany. He dates the event – 40 days after the resurrection on Easter Day. He emphases the presence of eyewitnesses – the Ascension took place he writes “before their very eyes” (Acts 1:9). Yes, the Ascension was a real event of history. Some people are puzzled as to why Jesus waited around on Earth 40 days after his resurrection, but that period is no accident, and Jesus had things to do. Jesus had endured the Devil’s temptation for 40 days in the wilderness at the beginning of his public ministry, but now the tables were turned. In the period after Jesus’ resurrection, He triumphantly paraded his victory over the Satan. During this time, the conqueror of death displayed his supremacy before his faithful followers so that they might share in the joy of his victory. But there was another reason. Those 40 days of his appearing after the resurrection were of immense value to the believers for they established the reality of his lordship. A single sighting of the risen Christ may have been open to question, but his continuous encounters with the disciples would remove the doubts of the most skeptical among them and assure them of his power and authority. The resurrection of Jesus marked the ending of a chapter in his earthly life. Things could never be the same again and it was essential that there should be a clear-cut event to bring the chapter to a close. It’s true that Jesus was making a series of appearances to his followers, but they couldn’t go on forever. It would have been odd if Jesus’ post-resurrection appearances had grown fewer until finally they just stopped – that would only cause confusion and even loss of faith. No, there had to be a single, miraculous occurrence, separating the time when the Jesus of Earth would become the Christ of heaven. 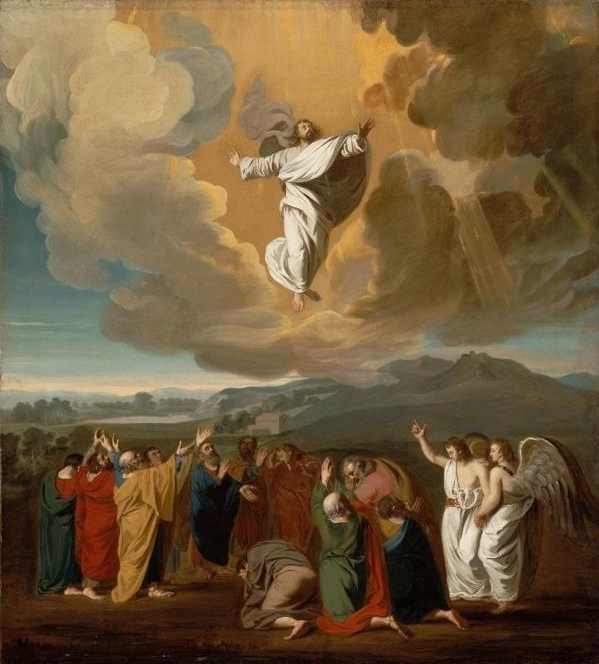 The Ascension was the only fitting conclusion to the life of Jesus on Earth. Luke tells us of the disciples with their eyes straining to catch the last glimpse of the cloud bearing up their Lord. But then they were quickly brought back to earth. It would seem that with their eyes heavenward they didn’t notice the two heavenly beings that slipped quietly alongside them until they spoke: “Men of Galilee, why do you stand looking unto heaven?,” as if to remind the disciples of the work that they had been given to do. The angels, for angels they were, had to tell the disciples to get to business. Where do we start? Jesus has the answer for that, too. In John 13 Jesus says to us, “ But I am giving you a new command. You must love each other, just as I have loved you. If you love each other, everyone will know that you are my disciples.” We are to continue to change the world in the work that Jesus has given us to do by helping others to see Jesus through and in us, by showing that love that he demonstrated, by bringing that love to everyone. Jesus told us to love everyone. Love. Everyone. Period. Not just those whose politics are the same as ours. Not only those whose religion is the same as ours, not only those whose lifestyles are the same as ours.